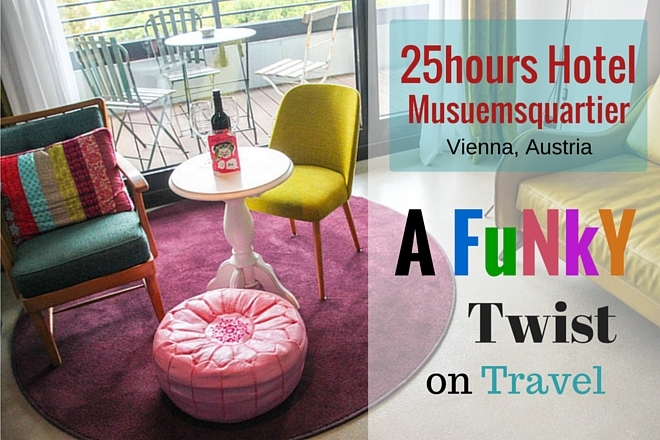 If you are looking for a unique lodging experience in the heart of Vienna, love great food and drinks, or simply want to drive a Mini Cooper around, then 25hours Hotel at Museumsquartier is the place for you! 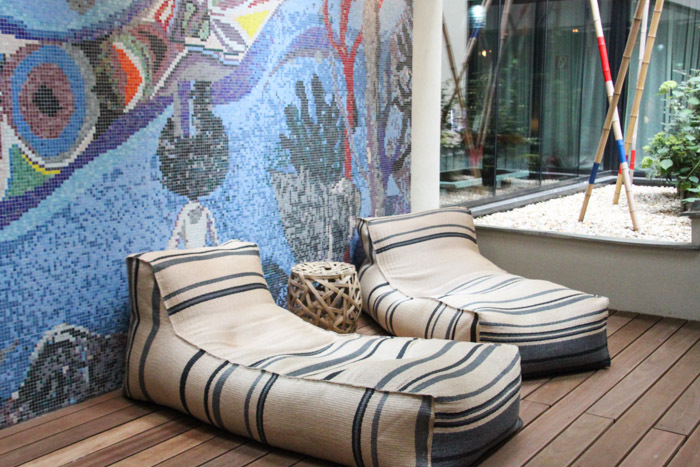 We thoroughly enjoyed our stay at 25hours in Vienna and would absolutely make a return trip to this hotel. 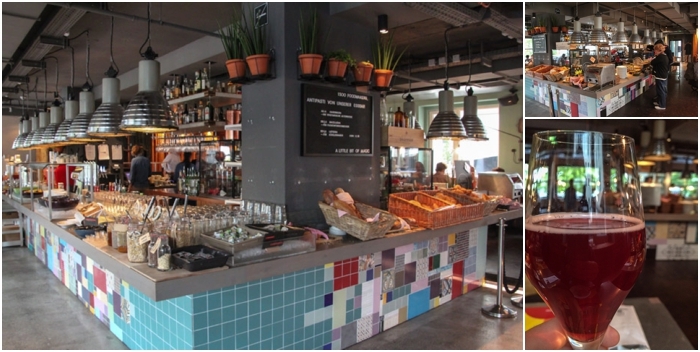 The staff is friendly, the hotel was quirky, and the on-site restaurant and bars are top notch. 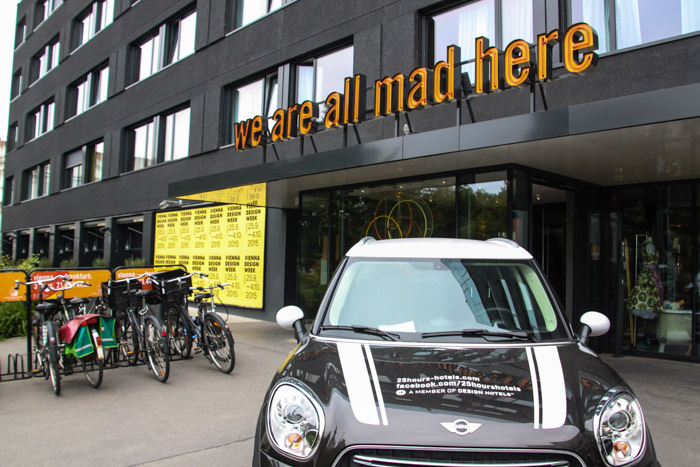 When we arrived and saw a Mini Cooper parked outside and the sign ‘we are all mad here’ splashed across the entrance, we knew we were in for an experience. Upon entering the lobby, we felt a different kind of vibe than most hotels, which is refreshing. Many hotels have a stuffy feel and are not very welcoming, but 25hours is just the opposite. It is laid back and relaxed with almost a hipster feel. And the Mini Cooper is actually a complimentary perk for hotel guests! You can sign up at reception and take it for a spin around Vienna. How cool is that?!?! If driving isn’t your thing, the bikes are free too! The lobby has a fun atmosphere (like all of the hotel) and is built for people to lounge. We saw lots of groups sitting around with drinks or standing and conversing throughout our stay. And we saw a diverse crowd, from businessmen in suits to young groups simply stopping by for a beer. It is nice to find a place where you can be comfortable without feeling underdressed and out of place. It allows people to be completely relaxed. Perfection. 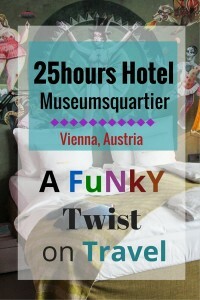 25hours at Museumsquartier is one of seven hotels within the 25hours group of hotels and the only one located in Austria. 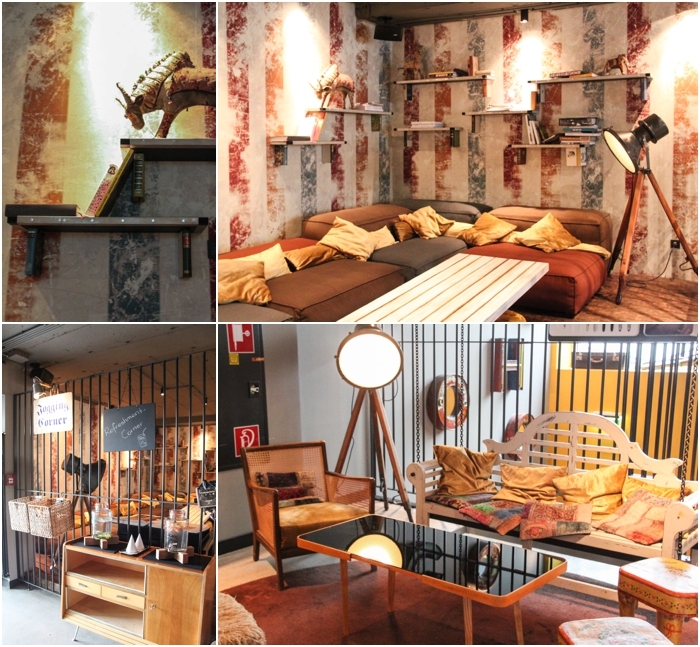 The hotel group tries to design each hotel based on the city’s past in some way and uses local artists and designers for the interior decorating. Vienna’s past included the circus and traveling performers and this theme is very evident, especially in the rooms. The rooms are clean, comfortable and continue the eccentric feel you get throughout the hotel. The bed was wonderful and the other amenities were the perfect little touches to make for a solid experience. Messenger bags are in the rooms for guests to use during their stay, which we took advantage of so we didn’t have to drag around our backpacks. And the complimentary shower products were fantastic, a huge perk for those wanting quality items on the road. Plus, you’ll find a yoga mat and hula hoop for keeping fit while away from home. How fun is that?! And if you are looking for a little luxury, consider the suite with a tub outside with a view. Sit back, unwind, and enjoy a a glass of wine while listening to Vienna hum. We eventually made our way to the basement and Mermaids Cave, which can be accessed by hotel guests for a one time fee of 10Euro per stay. 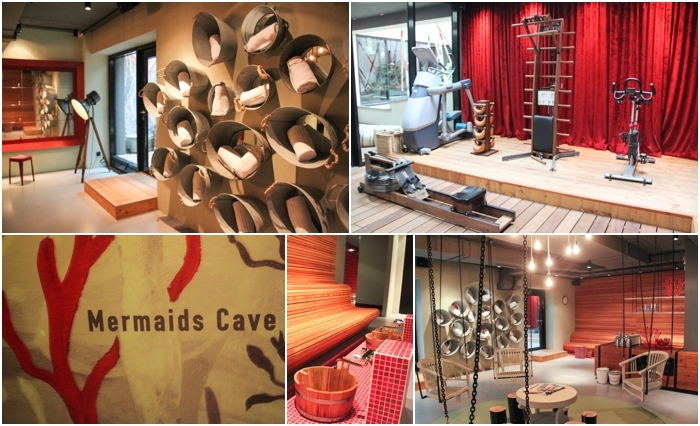 Included is a gym, spa treatments, and multiple relaxing areas. We thought the rooms were well set up and worth the additional money, especially if you are staying for multiple days. The restaurant and bars at the hotel are available to all guests, but these aren’t your typical hotel restaurants. 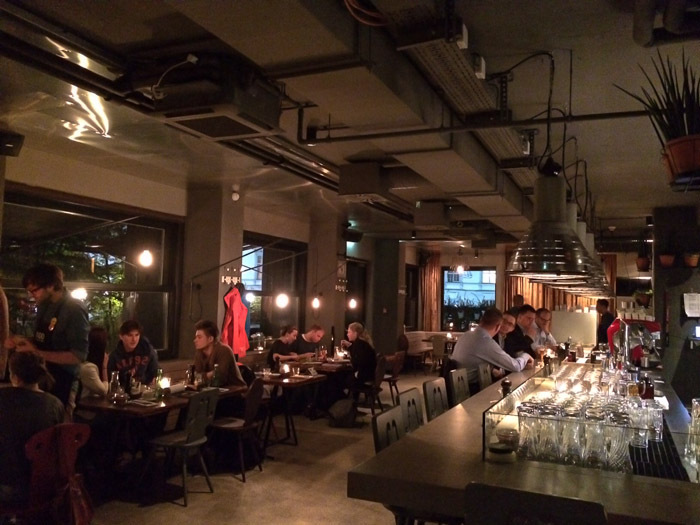 1500foodmakers restaurant located on the first floor and Dachboden bar on the 8th floor are destination spots for people throughout the city. We tried both spots and found more locals indulging than hotel guests. Oh, and if you are looking for a quick bite with even more of a chill feel, check out the backyard garden during the warmer months. You will find burger de ville, a converted airstream serving up burgers and drinks. So cool. 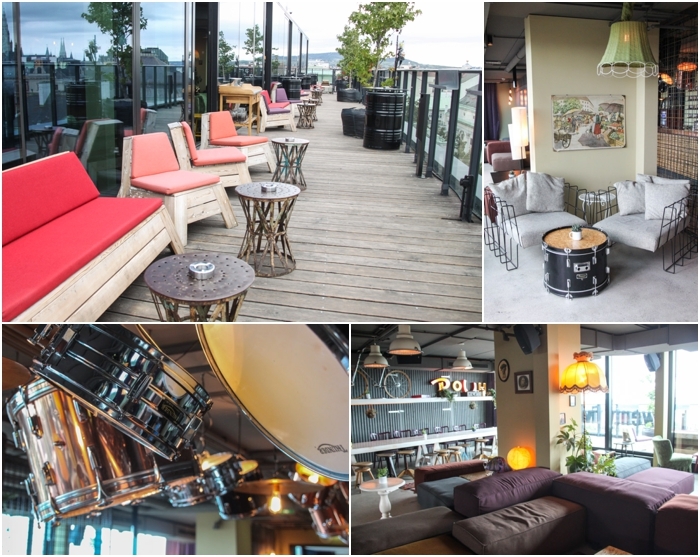 Dachboden, meaning attic, is the bar on the 8th floor. It’s decor is straight out of grandma’s attic, seriously. 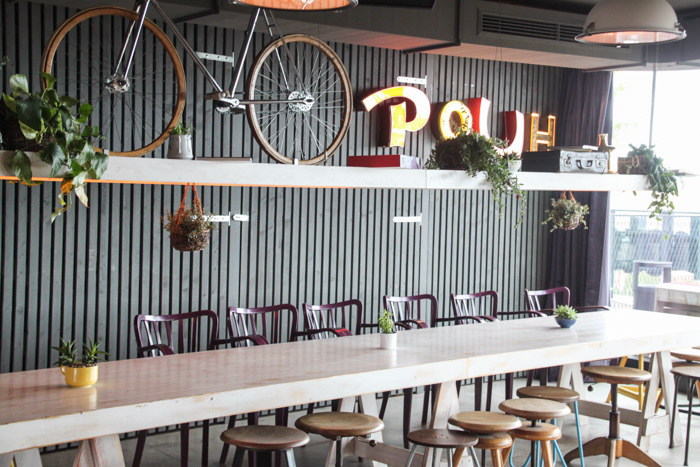 We headed up for drinks mid-week and found the place packed with a live dj spinning music. Plus, the outside views of Vienna are killer. Whether you stay at 25hours or not, we highly recommend you stop here for a drink. You won’t regret it! Lastly, a tasty buffet breakfast hit the spot in the morning, which was located in the 1500foodmakers restaurant. Alana was excited about kombucha being included in the juice bar area, so that made her day. The food selection was plentiful for both meat eaters and vegetarians…again, making Alana happy. You will definitely NOT go hungry at this place. Our time at 25Hours Hotel at Museumsquarter was memorable and a truly unique experience. 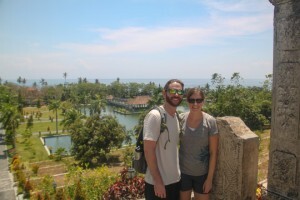 While it might not seem like a fit for all traveling types, we loved our stay and everything the hotel has to offer. From the great welcome, to wonderful food and drinks in the restaurant and bars, we had nothing but positives come from our time here. So, for those heading to Vienna and looking for a different type of hotel experience, give 25hours a chance and we guarantee you won’t be disappointed. And remember…they are all mad here. Our stay was made possible by 25hours Hotel at Museumsquartier. All opinions are our own. How cool!!! never been in a place like this!! Do you think that kids are welcome or not? It’s a very cool hotel and kids are absolutely welcome! 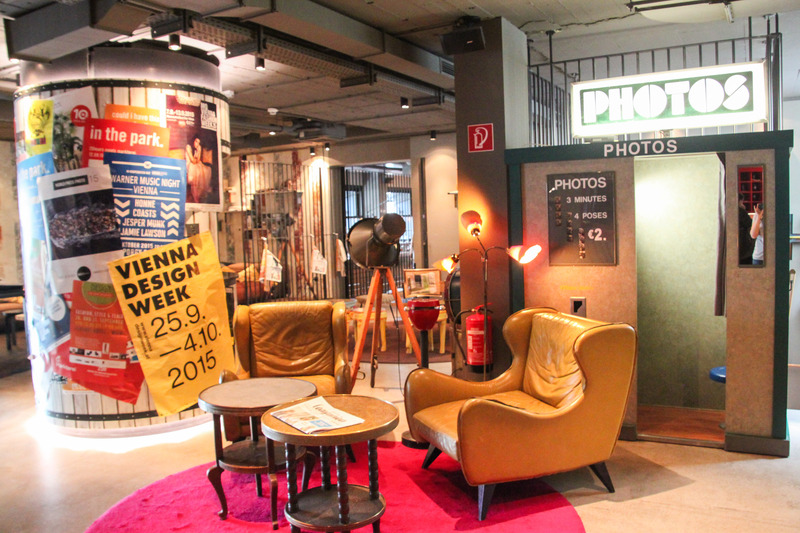 Very interesting – If in Vienna, check it out! Seriously, a hula hoop? Bit obscure but I love it. I do get sick of somewhat bland hotels/hostels with their magnolia paint so as to appeal to everyone (and really appealing to nobody). I would certainly stay in a place like this; it looks amazing. Sarah – Definitely. The same old thing gets old, really fast. This was a perfect spot try something fresh. If you head to any of these locations where a 25hours hotel is located, give it a shot! Now that is one cool hotel! It reminds me of a similar one that I’ve stayed in back in Asia. But yeah, these kinds of hotels sure make a stay more interesting! Hi Aileen – We couldn’t agree more! I love this! Such an intriguing concept. I love that front sign that says “were all mad here”…because aren’t we all. Absolutely! 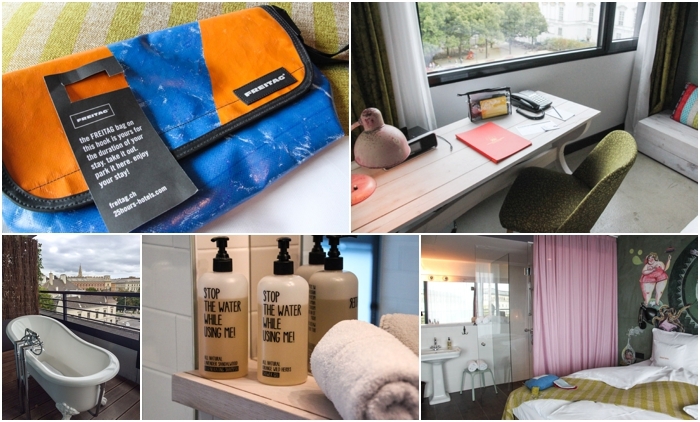 Very cool hotel and we hope to see the others in the brand soon!